Above: “Cold Case: FBI The Salem Witch” by William Dusty of Springfield. Below: “If I had a Penguin for My Pet” by Debra Rollend of Wilbraham. Two local authors have taken their avocations into their own hands and used different means of self-publishing to make their literary dreams come true. 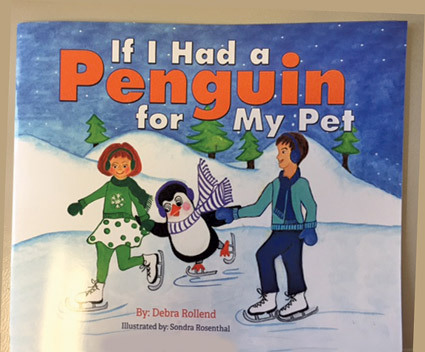 For Debra Rollend of Wilbraham that has meant finding an artist collaborator for her children’s book “If I had a Penguin for My Pet,” printing copies and distributing the book herself. Rollend said she has wanted to create a children’s book since her daughter was a young child. An accountant at Springfield College, she has been interested in writing since she was a child. Her daughter “has been listening to me for years [speak about a book]” and five years ago encouraged her mother to enter a writing contest. While Rollend didn’t win the contest, it “got me motivated to do it,” she said. “It was on my bucket list. I finally did it,” she said. “This story is based on my daughter Amanda’s love of penguins since she was young. She continuously asked me for a penguin, and I always tried explaining to her why she couldn’t have one as her pet. She loved to visit aquariums and zoos that had penguins wherever we traveled. My granddaughter now also loves penguins, recently asking Santa Claus to bring her one for Christmas,” Rollend said. One obstacle Rollend had to overcome was finding an illustrator. While visiting Chatham she went to a signing for another children’s author and was able to find her artist, Sondra Rosenthal, through the other author. Her daughter’s friend, a graphic designer, then laid the book out and prepared it for printing. “It was a project that was fun to see it come alive,” she said. Currently the book is for sale at Blue Umbrella Bookstore in Westfield Creative Edge in Longmeadow and Ohana School of Performing Arts in South Hadley. She is seeking other vendors and plans to sell the book at holiday craft fairs, was well. “It’s the toughest part, but I can’t give up,” she said. Dusty has taken a different route. His “Cold Case: FBI The Salem Witch” will be joining five other books that are listed on his Amazon author page (https://www.amazon.com/William-Dusty/e/B00JNT8LHI/ref=sr_tc_2_0?qid=1491314726&sr=1-2-ent). He described the plot of the book: “The Salem Witch tells the story of a mother and daughter who, ten years prior, had gone missing and are presumed dead, killed at the hands of the mother’s abusive boyfriend, who eventually walks free following an investigation that comes up with no bodies and no evidence to implicate him in the alleged grisly crime. A decade then passes, and, while traveling through western Massachusetts on personal business, FBI Assistant Director Marvin Ledds happens upon a newspaper story detailing the 10th anniversary of the long-unsolved case. Ledds decides that he has just the man – and just the right woman – to help solve this heartbreaking mystery. Right now the book is available at http://timminypress.com/product/cold-case-fbi-the-salem-witch/. Known for his “Springfield Intruder” local news and opinion website, Dusty explained he had been interested in writing fiction for years and started writing in 2013. His experience with a small digital press, though, was not a good one as the contract he signed gave the rights to the characters he created to the publisher. Dusty explained he was able to secure the rights and had an epiphany. He now has a system of developing a book. “I pitch it to the bigger [publishing] houses and the smaller imprints and I give them a year,” he explained. If he doesn’t hear anything, he proceeded to publish them himself through Amazon. In the past Dusty has approached between 25 and 30 literary agents to represent him to publishers and he received six responses. He has sent his manuscript to 15 publishers only to hear from one. By publishing himself, he can control the editing process as well as the creation of the covers and the book designs. He publishes a paperback edition through his own Timminy Press imprint, which is then followed by an e-book. Dusty is now preparing his next book, another mystery, “Cold Case: FBI – The Curse of the Bayous” for summer release. Dusty also facilitates a monthly meeting for Pioneer Valley fiction writers that convenes the second Tuesday. The next meeting will be at 6 p.m. on April 11 at the Holyoke Mall at Ingleside. Interested people can RSVP at www.meetup.com/Pioneer-Valley-Fiction-Writers.